Electronic skin patches able to perform tasks such as measuring glucose levels in people with diabetes and checking for dehydration in athletes are nothing new, but researchers from the University of Tokyo have taken things to the next level by adding an LED to an e-skin. 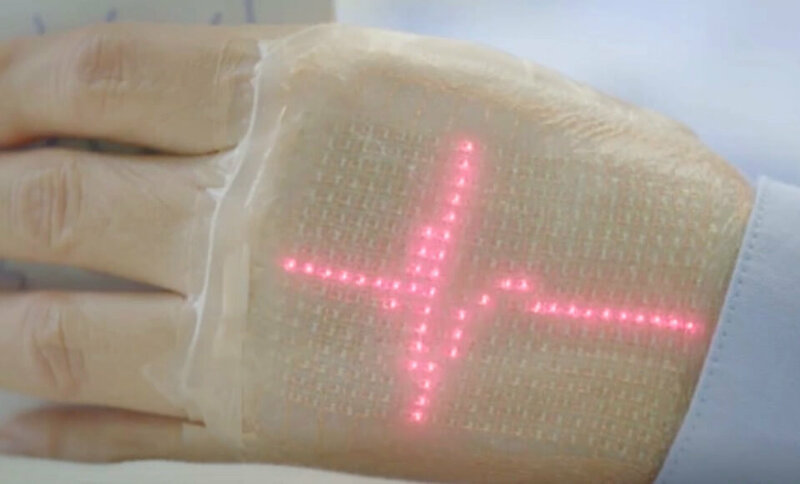 The ultrathin, band aid-style device features a micro-LED array that can, for example, show in real-time the moving waveform of an electrocardiogram. Featuring nanomesh electrodes and stretchable wiring, the patch is flexible enough to bend as a wearer moves their body while still displaying the images. It can stretch to 45 percent of its original length, and is more durable than previous designs. Professor Takao Someya, who led the development of the device, believes it can eventually be used to make reading information easier for the elderly and infirm, who can struggle with modern medical equipment. It can also be used as a way for professionals and family members to monitor wearers’ health remotely. “With this, even in home-care settings, you can achieve seamless sharing of medical data with your home doctors, who then would be able to communicate back to their patients,” Someya told AFP. The patch could also be used to receive messages, such as reminding patients to take their medicine. Someya even envisions the device as a way for distant relatives to send short texts to loved ones. Dai Nippon Printing aims to improve the reliability of the patch, increase production, and make it suitable for covering large areas. It hopes the device will be ready to hit the market within the next three years.